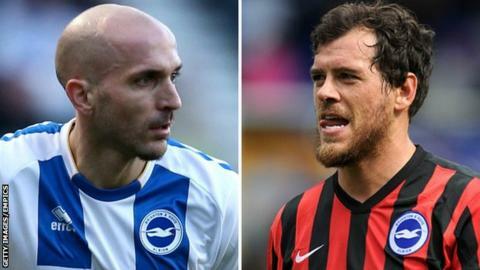 Brighton & Hove Albion defenders Bruno and Gordon Greer have signed one-year contract extensions with the club. Right-back Bruno, 34, and centre-back Greer, 33, will now remain at the Amex Stadium until the summer of 2016. "Gordon and Bruno are two important players for us," said Brighton manager Sami Hyypia. "They have great quality and experience and bring a great deal to the squad in terms of their leadership on and off the pitch." Greer was appointed Brighton captain shortly after joining the club from Swindon in 2010. He has gone on to make 189 appearances for the Sussex outfit, and has also won five international caps for Scotland. Bruno joined from Spanish side Valencia in the summer of 2012 and has scored four goals in 77 outings for the Seagulls. "Gordon has proved to be a great captain for this club," added Hyypia. "He works hard and is a key player for us. "Bruno has great quality on the ball and has shown he is capable of producing that when playing in several different positions." Meanwhile, Brighton have confirmed they will comply with the Football League's Financial Fair Play regulations, which allow a loss of £8m for the 2013-14 season.